It has been a horrible year for Research In Motion (RIMM), and things may not be getting any better for the BlackBerry maker come 2012. Despite all of the buyout speculation that has reached a fevered pitch these days, RIM's stock has been a disaster. The shares that began the year at $58.13 -- and peaked at nearly $150 three years ago -- have been whittled down to the low teens. Technically, RIM is still growing. There were a record 75 million BlackBerry owners at the end of September, 5 million ahead of where the tally was just three months earlier. Unfortunately, it's a foregone conclusion that RIM is toast. The future won't be as bright as the past, explaining why RIM investors believe that the company is worth just a tenth of what it was valued at several summers ago. You can't judge a handset maker by its installed base. Yes, RIM has never had as many subscribers to its platform as it has at this very moment, but it will likely be a different story once these two-year contracts run out. Companies where IT departments dreaded anything other than the BlackBerry standard for their fellow employees have warmed up to Apple's (AAPL) iOS and Google's (GOOG) Android, which have become the operating systems of choice with consumers. If Microsoft (MSFT) plays its invested billions just right, it too will become yet another viable option for smartphone owners. There was a time when RIM's standard was so magnetic that users proudly called themselves CrackBerry addicts. However, that was also when secure email and limited browsing seemed to be enough for a mobile device. Along came Apple's iPhone in 2007, complete with a rich ecosystem of touchscreen apps and rich yet pocket-ready multimedia streams. RIM is trying, but it's too late. Analysts see revenue declining 5% this fiscal year ending in February, and another 5% in fiscal 2013. This may not seem so bad, but it gets downright grim when we key in on the bottom line, where Wall Street's braced for a 35% plunge in profitability this fiscal year -- followed by a 26% dive next year. Margin erosion is inevitable. RIM is being attacked in all directions. As a proprietary platform, RIM is challenged on the high end by the sultans of style and design at Apple. A year ago, Apple's stateside distribution was limited to AT&T (T), but now the iPhone is available through all three of the leading wireless carriers. Android is killing the smartphone market on the low end with Android. As it's an open-source platform, any handset manufacturer can hop on the operating system. The result is that Apple and Google -- two companies that didn't even have an operating system on the market five years ago -- now have more than 200 million activated devices apiece. Where do we go from here? Well, let's not sell Microsoft's chances short -- especially since it's already chummy with the IT pros who have loosened their preferences on BlackBerry. Microsoft agreed to pay Nokia (NOK) billions earlier this year for the global handset leader to embrace Microsoft's mobile operating system as its smartphone platform of choice. We're just starting to see Nokia phones backing Windows Phone 7 now, and more will come in the future. RIM was a pioneer, raising the bar on what Palm was achieving. No one stays on top of this hill forever, and now RIM is making way for Apple and Android. 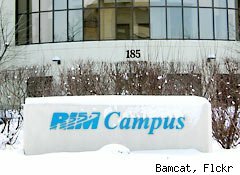 Will RIM come to its senses and cave in to a fire-sale buyout? Perhaps, but it won't end well. Just as Hewlett-Packard (HPQ) thought that it was getting a bargain when it acquired Palm in a $1 billion deal, RIM's potential suitor will also grow to have buyer's remorse. The game has changed. Who needs BlackBerry's closed ecosystem when Android is available for free? In an extreme example, Nokia is actually being paid to cheer on another operating system. If even Apple's platform may eventually be threatened, what chance do you give RIM's early but now-tired platform of succeeding? RIM's best days are in the past, and memories don't move share prices higher. Longtime Motley Fool contributor Rick Munarriz does not own shares in any stocks in this article, except for HP. The Motley Fool owns shares of Google, Microsoft, and Apple. Motley Fool newsletter services have recommended buying shares of Microsoft, Google, and Apple, as well as creating bull call spread positions in Apple and Microsoft.